This paper is concerned with the post-processing of motion-captured data. The post-processing is needed for several reasons: jerky motions due to sensor noise, violation of body constraints such as extraneous joint D.O.Fs, generation of new motion by editing existing motion data, and application of a motion to different character models. 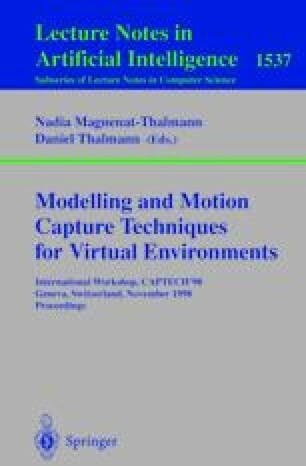 In this paper, the process of generating animated motion is viewed as a dynamic system, which takes the captured motion as input. Within a single Kalman filter framework, we were able to handle the following problems effiectively: satisfaction of physical constraints inherent to human body, user-specified kinematic constraints, motion transition, and noise reduction. This work is partially supported by the Electronics & Telecommunications Research Institute (ETRI) under constract ETRI-8MG2600, and Center for AI Research (CAIR), KAIST.